The city allowed the basement of the defunct Greenpoint Hospital Nurses' dormitory to flood for two years before capping the leaking pipe. GREENPOINT — The city allowed gushing water from an open pipe to flood the basement of a building at the Greenpoint Hospital — a candidate for the National Register of Historic Places — for two years before capping it. The leak occurred in the former nurses' dormitory of the partially dormant 5-acre hospital campus, which neighbors have been pushing to get redeveloped for the past 30 years. And the open pipe was further proof that the city is in no hurry to restore the property, they say. "They want a reason to tear down the nurses' residence so they just let it get destroyed," Jan Peterson, 75, a founding member of the Greenpoint Renaissance Enterprise Corporation, said of the leak. "Why should the city even be allowed to manage it?" Peterson and the GREC have crusaded against the city since the 1980s to redevelop the former Greenpoint Hospital site for community use. The city said that they were unaware of the leak until DNAinfo New York brought it to their attention, and denied that any damage occurred because of it. Three "urban explorers" who visited the building over the last three years confirmed the leak and two provided photos and video that date back to April 2014. Although the leak was not visible from the outside, the sound of rushing water could be heard emanating from a basement window of the building. "The water was 1-3 inches deep in various places, covering the whole floor," explorer and cartoonist Julia Wertz, who visited the building in 2014, said. "I don't know what the basement floor was made of previously, but at that point it was very soft, almost like dirt. It was not close to a drain, the basement is huge and the water was covered everywhere. There is a drain somewhere, or else it'd be 5 feet deep, but it doesn't matter since it's not draining it enough to get the inches of water out, which did the most damage. Wertz, 33, said she tried to report it to the city over two years ago, including filing multiple complaints with 311. "No one would return my calls or emails or answer my online forms," she said. "I'm not entirely convinced anyone is even looking at these reports." The city fixed the leak a month ago, one day after being notified of the leak by DNAinfo, but not before millions of gallons of water were wasted. According to a photograph provided by the city, a new plug was installed to the faulty valve. "The leak was fixed the day it was brought to our attention," Department of Citywide Administrative Services spokeswoman Cathy Hanson said. "Our plumbers found no evidence of damage." 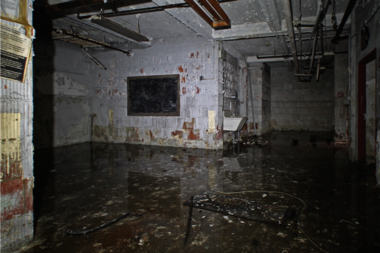 Hanson said there was no standing water in the basement, but a photo provided by Wertz shows that the room was flooded. The DCAS would not provide an estimate for when the leak began, nor a date for when they last inspected the property. The DEP would not comment on whether the city would be fined for water violations related to the leak, nor what capacity they had to detect or respond to leaks in general. According to the DEP rules governing water supply access, properties vacant longer than a year must have their lines severed from the water grid. The nurses' quarters at Greenpoint Hospital has been abandoned since the 1980s. According to the New York City Water Board's billing rules, water customers may have up to half of their bill forgiven in cases of "extraordinary" leak. Unpaid water bills can be held as a lien against a property, the billing rules stated. The nurses' dormitory in Building 2 has been a controversy since the day it first closed. For decades the city tried and failed to negotiate a deal for its development. Most recently, in 2012, a development plan was canceled after one of the awarded developers was indicted on bribery charges related to another city deal. The city said that the two-year bidding process, which has yet to begin, would have to start again. The community's proposal, which was runner-up to the corrupt developer's proposal, would have to wait years more, once again. The bidding process has not yet started because "the pre-development process is still underway for this site," according to the Department of Housing Preservation and Development deputy press secretary, Juliet Pierre-Antoine. "New York's State Historic Preservation Office declared this site eligible for landmark status on the National Register of Historic Places. We are analyzing development options under these new conditions." Some of the buildings on the Greenpoint Hospital campus date back to 1914 and were built in the "Renaissance Revival" architectural style designed by Frank J. Helmle, a prolific Brooklyn architect. Earlier this year, HPD told DNAinfo that redevelopment of two buildings on a vacant lot on the campus was stalled because a laundry facility for the homeless occupied the site. The Department of Homeless Services would not provide clarity on the laundry facility plans.